We have extensively tested the HARduino board over the past few days. We have been testing the GSM version due to the lack of NB-IoT coverage in the region of our office in the North of Germany but both NB-IoT and GSM exhibit the same characteristics in the tests we carried out. 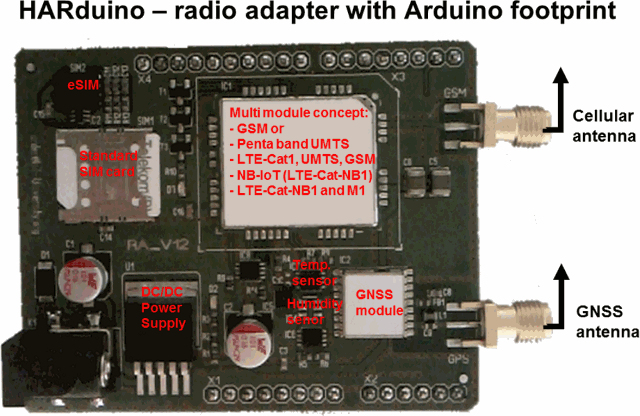 The AT command set for NB-IoT (LTE-Cat-NB1), LTE-Cat-M1, LTE-Cat1, UMTS and GSM modules are virtually identical. The code is written for SMS and USSD we can easy migrate across the new NB-IoT barrier and the antenna and SIM interfaces have the same specification. The feedback on the HARdunio blog post and emailing was great. We have taken many orders from around the world and will commence shipping of HARduinos soon. We have listened to our HARduino community and already made some changes in response. We replaced the sensor with a better multi-parameter sensor able to read temperature, humidity and air pressure. With this change, any HARuino can now support, for example, a small weather station. We also added a small extension slot to the radio shield with 3.3 Volt, 5 Volt, Ground, SPI Bus and I2C bus connections. This extension slot allows further sensors such as accelerometers or gyros on two layer PCBs to be added. We are delighted to reveal that we now have a sponsor for HARdunio. We are confident that a popular antenna manufacturer will contribute a set of Flex PCB antennas to HARduino. To support the Flex PCB antennas we will add a slim U.FL coaxial connector in parallel to the SMA connector. The SMA connector will not be soldered to the PCB but fitted to the set of components enabling users to easily rework the radio shield design to create an SMA variant. Extension slot for accelerometers, gyro etc. We are seeking further sponsors. We funded the development of HARdunio internally but sponsorship will provide the support needed to continue development of the technology to better serve our community’s needs. We are committed to delivering value to the HARduino community a thank you in advance for your support, orders of HARduinos and accessories and for sponsorship of the HARduino programme. I want to buy two Kits. I am developing oneM2M based application and want to test it in NB-IoT network. Will I be able to use this kit for testing my oneM2M application in NB-IoT network from Bangalore, India? Hi Pankaj, we ship worldwide. Your order is welcome.